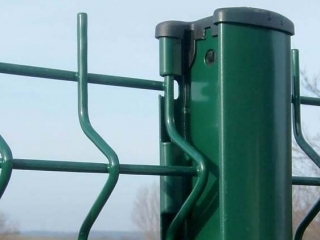 peach post fence is widely used for railway, factories, industry area, workshop isolation, civil engineering, residential area, sports field, airport, prisons and other isolations for various fields. Post sizes: 70mm*100mm*1.2mm; Mesh opening: 50mm*100m, 50mm*200mm, 55mm*100mm, 55mm*200mm, 60mm*100mm, 60mm*200mm; Wire diameter: Φ4.0mm, Φ4.5mm, Φ5.0mm, Φ5.5mm, Φ6.0mm; Out dimensions: High 800mm-4000mm* wide 2000mm-3000mm. Peach post fencing is composed by zinc plated then plastic coated panel and hot dipped zinc plated then plastic coated posts. Inserting hanger design make the post and panels a perfect unit. No joining parts are needed, it is connected with buttons pushing installation, simple and convenient. Peach post for fencing has fine craftmanship, innovative and unique design. Loading proof design for caps and posts, TOX joint enables perfect connection of the two sheet layers, this ensures the zinc coating layer with no damage to the maximum extent. 3D Curved Welded Wire Mesh Panel Fence With Peach Type Post.